We operate modern, licensed and fully insured vehicles, including £5 million public liability insurance as standard. Covering Manchester, Liverpool, Newcastle, Durham/Tees Valley, Leeds/Bradford, Blackpool and Glasgow. Plus, any other airports by arrangement. We operate a luggage transfer/forwarding service to anywhere in Cumbria, South West Scotland, Northumberland, County Durham, North Yorkshire and further afield if required. We operate in one of the most beautiful and spectacular parts of England, so why not book a minibus for a trip around Cumbria's Lakes and Fells or to Northumbria's Hadrians Wall? We specialise in wedding party guest transport. 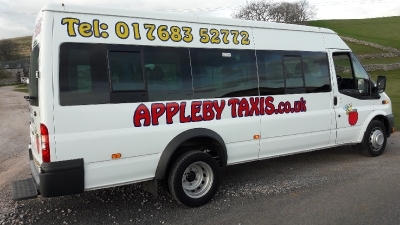 A service which includes transport to and from the church, to the reception and to take your guests home after your big day. We can also collect your guests from airports and railway stations. Our 8 seater minibus is wheelchair accessible. All our vehicles have 3 point seat-belts for you and your child's safety. All our drivers have undergone a current criminal record bureau check and also have social service clearance through Cumbria County Council. We also provide transport for nights out to pubs/clubs, restaurants, trips to the races, theatres, ice rinks, you name it - we can do it!